Dong quai is a member of the celery family. Greenish-white flowers bloom from May to August, and the plant is typically found growing in damp mountain ravines, meadows, river banks, and coastal areas. The root is used in herbal medicine. Dong quai has been used either alone or in combination with other traditional Chinese medicine herbs to help relieve painful menstrual cramps. 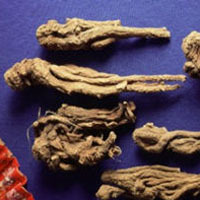 In Traditional Chinese medicine, dong quai is typically used in combination with herbs such as peony and osha for menopausal symptoms and menstrual cramps.